There are three billing statements over Summer Session, which will be posted on your portal. You may start paying any time after charges post to your account. If your account says "Future" it is likely because you enrolled between billing statements, and you will have to wait until the next billing statement to pay. There are no Student Business Services payment plans available over summer. You can create your own plan, but all charges must be paid by the final due date (August 14). Housing and meal plan dates need to be paid by specific due dates. Please see your contract via your housing portal (studenthousing.ucsc.edu) for specific dates. Students eligible for financial aid will receive aid shortly before the session begins (if you enrolled by June 1). If you're in classes both sessions, it is split between the two. It will credit directly to your billing account, and any remaining tuition and fees can be paid using payment options below. UCSC students - visit our Financial Aid Office for an estimate of your package. Visitors - please contact the aid office at your campus. To see your charges and due dates and view your billing statements, log on to my.ucsc.edu. Click on the My Account $ tile. You will see your charges due by due date. Click on the green 'arrow' to see the detail of the charges due. To view your billing statements, you can click on UCSC eBill/ePay or click on Billing Statements on the left. You may use a credit card to pay charges for Summer Session. Use the housing option to pay summer room and board charges only. For all other summer charges: registration, campus fees, course fees (aka tuition) use the summer session tuition option. You cannot use the credit card option to pay for Late Fees or any other type of Miscellaneous charge. The vendor charges a non-refundable convenience fee of 2% of the total fees paid by credit card. The credit card option is not available for fall tuition/fees or the Masters in Education program. eCheck payments make a payment from your checking/savings account – like writing a check (using your routing and account numbers). UCSC/SBS echeck payment: make an eCheck payment via our standard UCSC eBill/ePay link in my.ucsc.edu. Pay in person with cash/check/cashier's check/money order at the Cashier's Office in 102 Hahn. If you enroll, you're committing to all tuition and fees. If you "drop" a class on my.ucsc.edu by the deadline, your tuition and campus fee is refunded. Mark your calendars with these important deadlines. 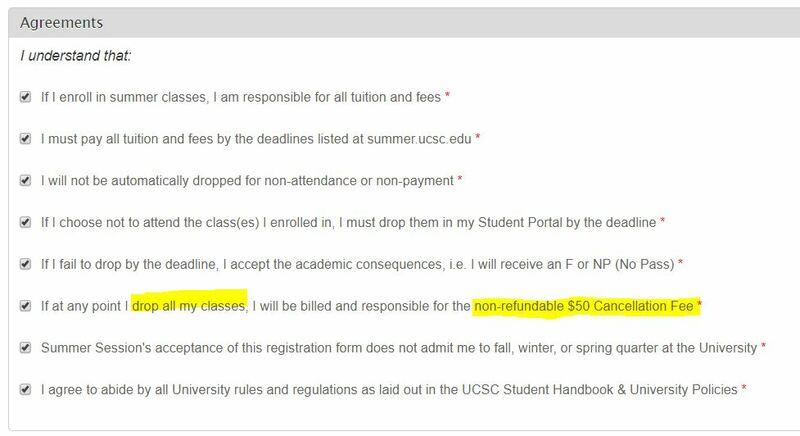 Per University Policy, if you withdraw from the summer quarter (aka drop all your classes), you will be charged a $50 non-refundable cancellation fee, even if you drop before classes begin. To start the refund process, the course must be dropped completely at my.ucsc.edu before the drop deadline (see our Summer Academic Calendar for drop deadlines). Always verify your drop is successful before you log out (i.e., refresh your portal to be sure the class is gone). You will not be dropped by a professor for nonattendance, or by UCSC for nonpayment - you must drop yourself. If you have not yet paid, the appropriate tuition and fees are automatically removed from your portal. This can take 24 hours to refresh. If you have paid, this process is not immediate. It can take time for refunds to process, the check to be mailed/delivered, and so on. You can call Student Business Services at (831) 459-2107 to ensure the process is underway - they may be able to give you an estimate. eCheck payments will either be refunded by direct deposit or by check. Checks will be made payable to the student and mailed to the mailing address found on my.ucsc.edu. If a credit card was used, every effort will be made to refund back to that credit card. Due to timing issues, refunds are sometimes made via direct deposit or check. If you drop ALL your summer courses a $50 Cancellation Fee will be charged to your account. After the drop deadlines, you are not eligible for a tuition refund. Instead, you may request a "W" from a class. Please see our page on Adds, Drops, & Withdrawals for more information. Summer Session classes are rarely canceled. If a class is canceled, every effort will be made to notify you beforehand, assist you in enrolling in a different class or issue you a full refund. You will not be penalized. Class cancellation policy requires a minimum number of students enroll by May 31. Lower division classes need 12 students enrolled; upper division classes need eight students. Be sure to check the Registrar's Class Search, your @ucsc.edu email account, and the student portal for updated information on course changes and cancellations. 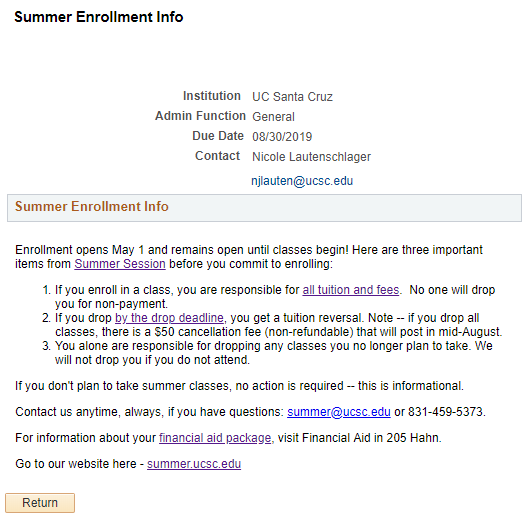 A $50 cancellation fee will be posted to your MyUCSC account if you enrolled in summer courses at any time and then dropped your course load to 0 credits for the rest of Summer Session. This fee is nonrefundable. 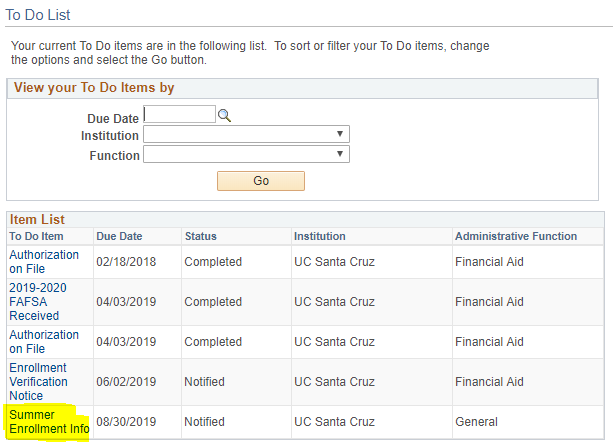 The following message was posted in every active UCSC student MyUCSC Portal on your "To Do List" in April so students have the information before enrolling. The registration fee for setting up/activating your MyUCSC account is nonrefundable. The following messages were accepted by every visiting student and inactive UCSC students in order to submit your registration.